How smart is this. 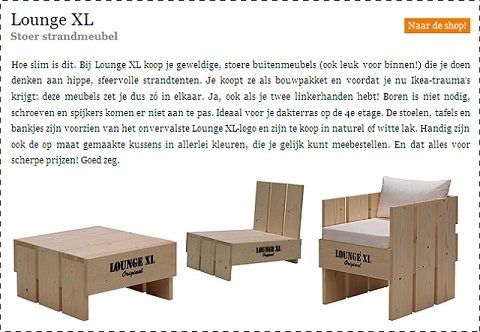 At XL Lounge buy great, sturdy outdoor furniture (indoor fun!) that make you think of hip, cozy beach bars. You buy them as a kit and now before you get Ikea trauma: the furniture is set up like that. Yes, even if you have two left hands! No drilling necessary, screws and nails are not involved. Ideal for your flat roof on the fourth floor. The chairs, tables and benches are provided with the unadulterated Lounge XL logo and are available in natural or white lacquer. Are also useful in customized pillows in different colors, you can right meebestellen. And all at competitive prices! Well say.